I’ve been thinking for some time about a series of posts on E. L. Moore and what his articles and projects might mean here in the 21th century. I figured I’d make a start as a prod to get me to write the rest. Here goes. 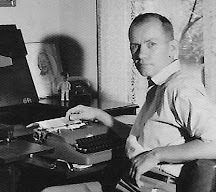 E. L. Moore was one of the most prolific writers in the model railroading press in the mid 20th century. Although he wrote on a number of model railroading topics, his specialty was articles on how to scratch-build model buildings in HO-scale. His first article about constructing model buildings appeared in the July 1955 issue of Railroad Model Craftsman. In the 1960s and 1970s – the mid and late periods of his career - Mr. Moore published 59 articles in Railroad Model Craftsman, 30 in Model Railroader, along with 5 in Railroad Modeler. During his prime in the 1960s, his yearly output was quite impressive. For example, in 1966 he published 8 articles in Railroad Model Craftsman, and followed that up in 1967 with 9 more in Railroad Model Craftsman and 3 in Model Railroader. For most, if not all, of the articles he wrote, as well as writing the text he designed and built the model in question, took the photographs, and drew the accompanying plans. His output tapered off throughout the late ‘70s, and his last article, A firecracker factory, was published posthumously in the July 1980 issue of Railroad Model Craftsman. I’m in the process of documenting and annotating Mr. Moore’s complete publication history. What I’ve got so far is listed in the spreadsheet I’ve posted here (to read it you'll probably need to download and then magnify it). I’ll be updating it from time to time as I learn more and figure out the missing pieces. I should point out that this compendium makes use of the excellent work that has been done by numerous gentlemen at this Railroad Line Forum discussion thread to compile lists of all published E. L. Moore articles known to exist. I’ve also drawn on Model Railroader’s 75th Anniversary Collection as well as my own collection of model railroading magazines. 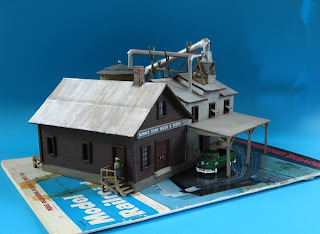 In terms of model buildings and structures available for model railroads, Mr. Moore’s era was quite different from where we sit in this part of the 21th century. Today we have a vast array of kits engineered to very high standards, but back then there was far less choice, and, for the most part, the quality was quite different from today’s offerings. Mr. Moore’s articles filled an important need in the hobby, and he did it with skill, imagination, flare, and a style all his own. He showed readers how to build a vast array of model buildings using relatively simple, and readily available, low-cost materials. Why would anyone build models from balsa, card, paper, strips of wood and various pieces of household ephemera these days? There’s really no compelling reason to given the large number of highly detailed kits, manufactured from all sorts of media, that are available these days. We live in a golden age when it comes to availability of great kits to build. I can only offer that it can be rather fun to make something from scratch from simple materials. Frankly, fun is the most important attribute of the whole enterprise. There are more mundane reasons, although they certainly aren’t as compelling as just plain fun. First, there’s the pop-sci neurological argument that being engaged in an activity that relies on strong hand-eye-brain coordination gives your brain a rather good work-out and generally strengthens it much like other now old-fashioned activities like writing in script, drawing, painting, playing the piano, solving math problems with pencil and paper, crossword puzzles, and other such activities do. There’s the “getting back to the roots” of model building argument that working with the most rudimentary of tools and materials gives one deeper insight into the use of modern methods. There’s the “it’s good to learn new techniques argument because you’ll never know when they’ll come in handy” argument, which isn’t that silly for a ‘serious’ model builder. There’s the “it’s a cheap-and-cheerful introductory lesson in how to make models of things you see or make up”, which to me goes hand-in-hand with fun. Sometimes I think that the most durable part of his legacy might not be the projects themselves, but the intangibles he brought to each one, which when taken as a whole, point towards an alternative direction for both the serious modeller and beginner: the ongoing creative use of humble materials. No doubt there are more such utilitarian arguments that could be made, and they have their merits, but don’t use them to convince a child to give them a try to make something. As a kid, The first article of Mr. Moore’s I came across was Bunn’s feed and seed plant in the August 1973 issue of Model Railroader. I tried to build it back then, but many parts of it were too involved for my limited skills. However, it whetted my appetite, and I eagerly bought and tried whatever Mr. Moore published in the model railroading press for the next few years. A particular favourite was The RMC Paper Company in the April 1974 issue of Railroad Model Craftsman. Although, having limited funds in those days, I improvised the brick with a technique I had read about in the November 1973 of Model Railway Constructor. Objectively, my efforts weren’t anything spectacular, but the cost-efficient immediacy of building things from everyday materials kept me going. They were a good introduction to scratch-building for an enthusiastic beginner. I got back into model railroading a few years ago, and although there are all those great craftsman kits out there, I wanted to try some of those old E.L. Moore builds. At first it was simply for nostalgia, but as I progressed, I wanted to see what he had written before my first discovery of his work back in the summer of ’73. At this blog I’ve written about the E.L. Moore projects I’ve built. Naturally, Bunn’s feed and seed plant was my first, and it was soon followed by Jones’ Chemical Co.. I went a bit further and built a replica of a Volkswagen truck that often appeared in pictures accompanying his articles to give my projects added ‘authenticity’. I even tried my hand at his brand of droll tall-tale narrative as a prelude to an E. L. Moore-esque build of my own concoction :-) But, in the end, those projects were plain and simple nostalgia builds. Hopefully, my next nostalgia build will be Cal’s Lumberyard published in the April 1973 issue of Model Railroader – which was a project I discovered in ’74 in the local library’s small collection of ‘old’ Model Railroader magazines. Next came Uncle Charlie’s Bookery, and Moe Lass’ Old Sorghum Mill. They were my first forays into his backlog. I should mention that they were chosen because they were physically small projects that would fit into my current layout, and because I found I had some affinity to Mr. Moore’s articles about them. They aren’t representative of his larger building projects. From those builds, and reading about many others in his articles, I’ve come to appreciate his legacy more, and what it might mean for today. Basically, I think it’s more significant than just seeing it as a large collection of dated – from today’s perspective – scratch-building projects. Note: The second instalment in this multi-part series can be found here. The 3rd instalment can be found here. This is great - really looking forward to this series. EL Moore, as you know, is a great favourite of mine ...I was smitten when I saw his "8 Ball Loco Works" in the MRC and tried to read as much as I could of his work. So thanks for this! I'm a big fan as well - which I guess is obvious from my blog :-) His articles had a significant influence on my approach to the hobby and I'm looking forward to looking into his work in more depth in the months to come. E L Moore - fascinating feature. Thanks Tony. It's been an interesting journey so far. I am the builder of the E L Moore tribute diorama shown in the May OVAR Interchange. Thanks for your comments and the links to your blog. I built 3 Moore buildings many years ago: the fertilizer plant, the cider mill and the stock auction barn, RMC, May 1966. The later was apparently not among the buildings you viewed which is unfortunate as, in my opinion, this was his best work. Thank you for stopping by. I enjoyed your project. You're right, I didn't see the stock auction barn, and it was an excellent project - it's one of those I think of as being one of his 'high fidelity' projects. I haven't seen that one before. Thanks for forwarding the link! At 30 Squares I write about model buildings and streetcars with detours into other arts, crafts and sciences. Outhouses, backhouses and privies, oh my! A new type of locomotive kit?